The concept of 'peak oil' has been derided by the big oil companies for years, but last week the chief executive of the oil giant Royal Dutch Shell, Jeroen van der Veer, released a study forecasting the end of easy oil. Dr. Jim Buckee, retired president and chief executive of major independent Talisman Energy, claims he was not surprised that Royal Dutch Shell admitted oil supplies were getting tighter. 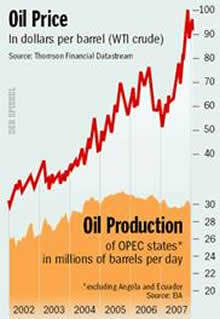 Dr. Buckee says 'peak oil' is either here, or very close. "It is the underlying decline of the world's major fields that is the dominant driving factor here," he said. "If you think that at the moment the world is consuming 30-plus billion barrels a year of oil and is finding seven or eight billion barrels a year, and this state of affairs has been going on now for 20 or more years. . . It's obviously unsustainable and the world is increasingly drawing on the bigger, older fields. You couple that notion with the irreversibility of decline and you've got a very alarming picture." Oil at $100 a barrel gives exporters an incentive to pump more, but their difficulty in doing so indicates the world is struggling to sustain production. A growing number of leading industry figures, including the CEO's of Total and ConocoPhillips, now question mainstream forecasts for supply. They suggest the era of "plateau oil" is nearer than many in the business have admitted. Nigeria has warned energy companies it wants to renegotiate oil and gas exploration and production contracts covering offshore oilfields in the next three months, claiming record prices are yielding a windfall to Western oil firms operating in that region. It is the first time Nigeria has come up with a timeframe for renegotiating the complex agreements. The government signaled late last year it would review the contracts in an effort to secure a greater share of profits from offshore production. Royal Dutch Shell, the largest foreign company in the strife-torn Niger River Delta, said it would take a $716 million charge against earnings due to the deteriorating security situation. Industry sources say that in addition to the production shutdown about 435 miles of pipeline and thousands of barrels a day of crude oil and condensates have been stolen. Much of the pipeline has been used for pillars in house construction. Nigeria 's government is also not paying its share of joint-venture investments in the Shell venture, claiming it cannot fund its portion. Nigeria has budgeted only $5 billion of the $9 billion it was supposed to invest in the Shell operated project in 2008. With oil markets booming Gulf states will enjoy a staggering, unprecedented increase in wealth over the next decade that will give them vast financial power across the globe. By one estimate, the five oil-and-gas-exporting nations – Saudi Arabia , United Arab Emirates , Kuwait , Qatar and Oman , with a combined population of 23 million citizens – will add $6.2-trillion ( U.S. ) to their revenues over the next 14 years. That's roughly the equivalent of adding Canada 's total annual output to their revenues every two years. Those estimates assume oil prices of $70 per barrel. The producer's revenues would increase at higher average selling prices. Average gasoline demand last month was 7 percent higher compared to the same week last year, even with prices 30% higher, according to a MasterCard report. China is set to become the world's largest consumer of energy by about 2010 according to a study by the International Energy Agency (IEA). 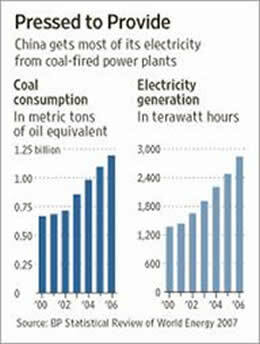 The World Energy Outlook report predicts that China will overtake the US in its energy use. The Chinese economy has expanded by 11.4% over the past year, reaching its fastest growth rate in 13 years. The Chinese economy is very energy inefficient. 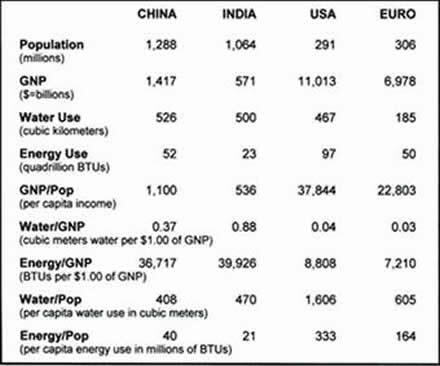 It takes more than four times as much energy to generate a unit of GNP in China than in does in the U.S. according to a recent study published by Gordon Feller (chart at right). China 's Prime Minister Wen Jiabao responded to growing public anxiety about inflation by announcing that China would freeze energy prices in the near term, even as international crude oil futures have continued to surge. Inflation has hit an 11-year high in China. Crude oil production in Mexico 's huge Cantarell oil field will continue to decline this year at around the same pace as in 2007, Pemex announced. Average daily production at Cantarell is forecast to drop by 200,000 barrels in 2008, increasing pressure on the state-owned oil monopoly to ramp up output at smaller oil fields. The Energy Information Administration reported a record-high 274 Bcf natural gas draw from storage for the week ended January 25 th . The five-year average draw is 185 Bcf. The draw from storage surpassed the previous record-high withdrawal of 260 Bcf (in January 1997) and comes on the back of powerful heating degree days that were 21% above normal. Low nuclear utilization is one reason for the strong incremental gas demand. Imports from Canada are also lagging. For the month the draw was 659 Bcf compared to a five year average draw of 580 Bcf. 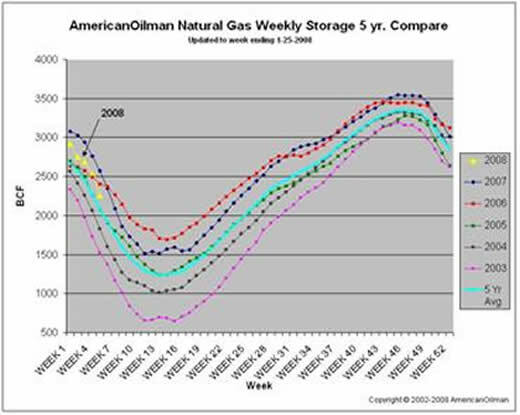 Working gas in storage now totals 4% above the five-year average and 13% below last year's levels. Depending on the weather the next couple of months the volumetric draw from storage could be the largest we have ever seen. The chart at right from AmericanOilman.com tells the story. From a five year high (blue line) in week 49 of 2007 we have fallen quickly (yellow line) in 2008. If trends continue we will need to inject much more natural gas into storage this spring and summer than we did in 2007, which should help keep prices firm. 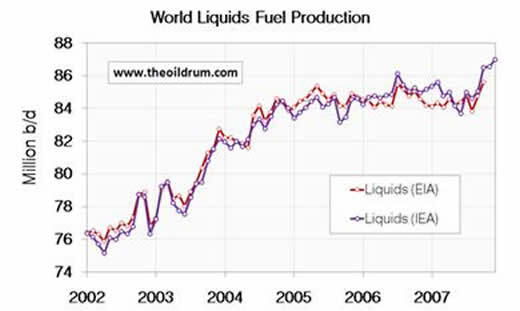 The latest production figures published on theOilDrum.com website indicate that liquids production has jumped upward the last few months after more than two years of flat production. ‘Liquids' includes both crude oil and natural gas liquids. Data is from the Energy Information Administration (red line) and the International Energy Agency (blue line), both credible sources. If 2008 global demand forecasts of nearly 88 million barrels per day are correct, even the spike in production will not meet the growing demand. In that case demand would have to be met by draw-downs in inventories. Or supplies would need to be rationed by higher prices. We think the supply and demand trends in the energy sector are long term issues, and that they present very attractive opportunities for investors.